Sooner or later, this was all going to stop being a hypothetical. Ever since word came down last year that Williams Baptist College would be putting together its own Greco-Roman program, the prevailing question most had went something like, So when are they going to actually wrestle? We now have an answer. 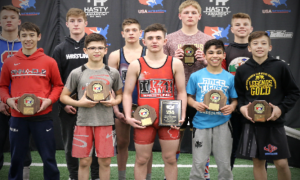 Williams Baptist Greco-Roman head coach Jonathan Drendel confirmed earlier this week that his fresh squad of athletes will be making its debut at the 2017 Dave Schultz Memorial, set for November 1st and 2nd at the Olympic Training Center in Colorado Springs. It’s a situation that has been forced to come together quickly. The program was announced in the fall of 2016; then Drendel and former WBC folkstyle coach Kerry Regner (who is credited with the team’s conception) were forced to try to rush in recruits. 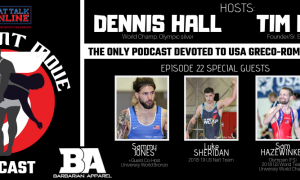 Now that the wrestling room is populated with a bunch of Greco upstarts, Drendel has had to bring everybody up to speed as fast as possible. 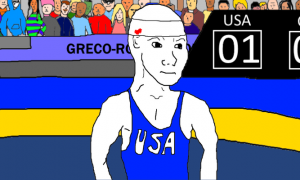 The Senior level of Greco-Roman does not include a novice division. 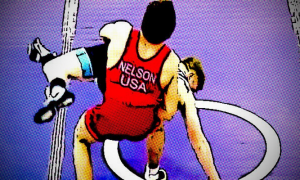 Match-ups are not predicated upon the amount of experience two wrestlers possess and a tournament like the Dave Schultz Memorial International is virtually guaranteed to pit a WBC athlete or two against seasoned, credentialed foreign opposition. Such is life and it’s something Drendel is quick to recognize. But there is no other choice available. The way the coach figures it, his charges need to get out there so they can understand the road ahead for their development. Training is the one aspect to all of this Drendel is most encouraged by. He mentions it often. 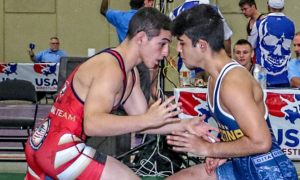 Since all of his wrestlers are already experienced in folkstyle, preparation has been centered mainly around injecting a more physical feel and promoting the idea that winning the grinding exchanges on the feet stand as the first steps towards progress. That makes sense. 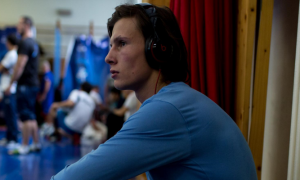 A former National-level competitor himself, Drendel knows better than most that while technique is important, Greco demands its participants be ready for all of the intense mini-battles that have a habit of determining when and where the action happens. Although the first question has now been answered and Williams Baptist Greco-Roman has its official competitive start date, the second query is a natural one: what happens next? The Senior domestic schedule in the US will be seeing a few changes this year with most of the events coming in the first half of 2018. The Dave Schultz Memorial and Bill Farrell/NYAC Open have essentially been switched, and the US Open has been moved to the spring. Everything else, be it the Junior World Team Trials or the University Nationals, arrive a little later. That would seem to leave space available for Williams Baptist wrestlers to get some experience in overseas. However, Drendel worries that doing so could have a detrimental effect so early in the game for his wrestlers. He’s willing to consider the prospect of putting an athlete or two on a flight across the Atlantic, but only on a case-by-case basis. First on Drendel’s agenda is sending a message. 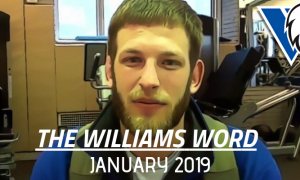 United States Greco-Roman wrestling has long needed another developmental program for collegians, which in turn, has rightfully put a whole lot of eyeballs on Williams Baptist College’s entrance into the fold. Progress inside the practice room is nice, but fans and coaches on the outside only see the event results. Because of this, Drendel senses the curiosity surrounding his team and also, the skepticism he doesn’t know is there but assumes might as well be. It’s all part of the job and he’s comfortable with whatever the expectations are — for now. That’s why for the time being, Drendel is trying to keep it simple. Listen to “5PM09: Junior World Champion Kamal Bey” on Spreaker.